I wanted to title this post, "Protecting DACA Students" and leave it at that, but I want my museum audience to know I am talking to them and that the institutions they work for are not neutral (shout out to #MuseumsAreNotNeutral on Twitter). I hope that my fellow museum workers take action but I also hope they push for their institutions to also take a stand because this issue affects our surrounding communities, the people we work with, and those we love. Today's post won't be on how I feel about this past Tuesday's announcement. This post won't be about inclusiveness in museums either, or the need to have our cultural institutions be safe spaces for POC. Additionally, I am not a DACA student so I won't write assuming what that experience is like. If you are in the museum field and have followed the conversation on diversity and inclusivity, then you know it has been an ongoing dialogue that I don't need to repeat here at this moment. Right now, what is important is understanding the facts on the issue, providing further information, and how you can help. This is a call to everyone to stand up for immigrants but I ask my museum colleagues to show communities of color that they are willing to go beyond the digital dialogue and do the right thing for their community. Everyone has a dimension of privilege, some greater than others. Each slice of privilege is something we should recognize, use to empathize, and take action for equality. Sometimes we can't change the privilege we've been given, sometimes we can. Even as greatly underrepresented as I have felt within the museum community, I understand that as a brown-skinned Latina, I have been afforded a special privilege given to me by my parents, that of U.S. citizenship. As a daughter of immigrants, there is still struggle, there are still obstacles to overcome but questions I never had was, would I be able to have a chance at attending college? Would I be allowed to have a chance to succeed in the only country I have ever known? What will happen if I am suddenly uprooted? There are so many layers to the various struggles communities of color face and it is unfortunate that so many traps are set out in front of us before we even begin our journey but acknowledging this single privilege in my life has given me the strength to stand up for DACA students and defend them in every way I can. 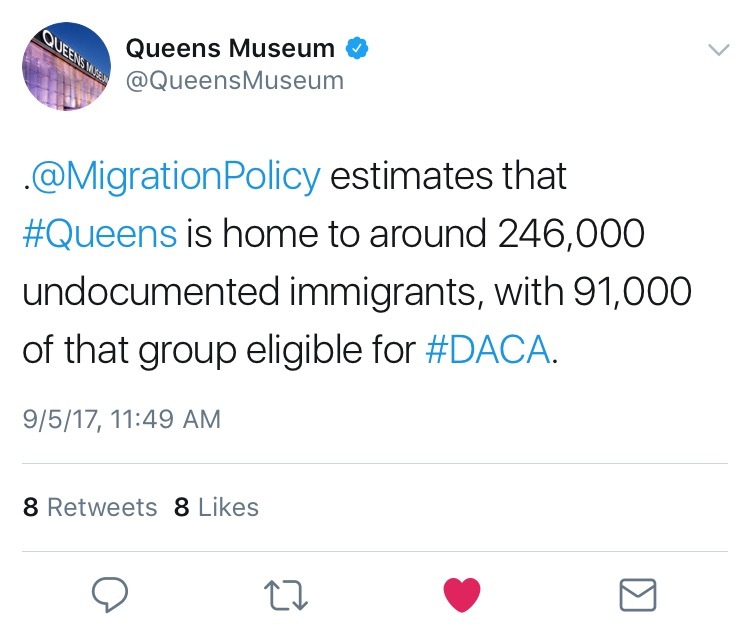 DACA students are not limited to Latinxs, but they constitute the majority of DACA recipients and you can find some of these hard working students in museum spaces and other cultural institutions. While some may want to vilify and dehumanize them in order to push a political agenda, I am hoping that more people gather the right information to combat the lies and contribute their time, money, and resources to protect these students who contribute so much to our society (and a fresh, much needed perspective for those in the museum field). University of California, Berkley - What is DACA?